WordPress version 3.6 has finally launched! It’s named Oscar and here’s a short video from the developers on what’s in store with the new features. Plus, here are my tips to help you safely make the transition. Before you make any major change to your site, like updating WordPress or plugins, do a full backup first and download the file. I use and recommend BackupBuddy (aff link). It allows me to do a complete backup instead of just the database. The complete backup includes all of the content in the database, plus my theme and plugins. If you’re not sure if your backup plugin does all of that, download this free report with 14 backup solutions. Will it Break My Theme? Not likely. The new HTML5 changes to the core will simply not work for any themes that do not support them. If you have a Genesis theme (StudioPress), you’ll want to know that the new Genesis 2.0 framework has an option for HTML5 support. Simply don’t check the box to turn it on until you have your theme updated by a qualified designer or developer. Also keep in mind that many browsers do not fully support all HTML5 features yet. So be careful what you rush to upgrade and always have a graceful fallback for lack of browser support. The one thing you may want to be in a hurry about getting theme support for is microdata, which is the way Google would prefer to index your site, via semantic search. Read all about it in my post, and more details on your theme. And then this post on semantic markup, especially in how the new Genesis themes will support it. And, Brian Gardner has announced that Genesis 2.0 will be out by the middle of next week. They need to tie up a few loose ends before release. Besides microdata, the big news is the adoption of HTML5 for audio and video in the core. That means native support for video and audio files without the need for a player. Simply input the link to the file and you’re done. Another big change is to revisions and how your work is stored. You’ll be able to pick up where you left off, even if you lose connectivity with your site. Plus, the menu area has a full revamp and is even easier to work with. Improved post locking features keep multiple authors from accessing the same file simultaneously. 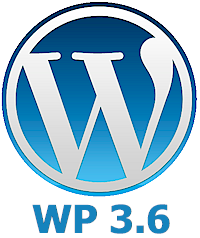 Need to get up to speed on WordPress 3.6? See all the new $1 menu tutorials in the BlogAid Video Tutorial Library. You can get the MP6 plugin and give your admin area a fresh coat of paint. This code was originally slated for the core, and probably will be included in the future, but you can get it now. The new Post Formats that were also slated to be in the core has already been pulled and is being developed as a plugin that will be released soon. The WordPress developers said they wanted to make a bold departure with this theme, and they succeeded. It is a single column design and fully responsive. Why is it Named Oscar? The developers chose to honor the great Canadian jazz pianist and composer, Oscar Peterson. And, it’s his music playing in the video below that shows you all the new features. Thanks for sharing. Finally moved to 3.6 and upgraded my Genesis with HTMl5 compatible. I think you wrote great and is definitely useful for beginners! Keep it up please and take care. Thanks for letting me in on the secret of MP6!